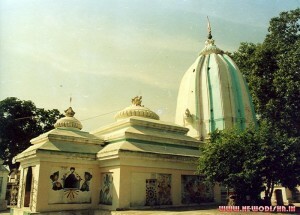 Rameswar Temple is one of the oldest temple of Subarnapur district of Odisha. This temple is situated on the confluence of river Mahanadi and Tel. The lingam of the temple is very old. Legend associates Lord Ram with its installation. Lord Kartik and Ganesh along with Goddess Parvati are worshipped here. A Durga temple is also found near the Rameswar temple where the image of a ten-armed Durga is enshrined. Here Durga is also worshipped as Shakti like Parvati. Outside the boundary of the Rameswar temple there is a Brisabha temple and a colossal image of Brisabha, black in colour is installed there. According to B.C. Majumdar the Rameswar temple was built by the Chauhans. But according to B.C.Rath the Somavamsis had built this monument. One can reach Subarnapur either by bus or train. From Subarnapur one can visit Rameswar Temple by bus or taxi. Give Responses for "Rameswar Temple of Subarnapur"